You might well think of yourself as a massive fan of Initial D. Perhaps your interest in all things petrol-soaked and grease stained is because of Initial D. Well, as big of a fan as you might be, you probably can’t hold a candle to Drift Hunter Albo Agunday’s fandom. And this past weekend, I went out driving with him. This isn’t the first time that Agunday has appeared on an East related segment... He was earlier covered by Brian Ashcraft at our sister site Kotaku. The difference is that while Ashcraft covered Agunday, he doesn’t actually know the driver featured in the video... But I do. I consider Albo both a professional acquaintance and a friend, and I knew I eventually had to go riding with him. I got my chance Saturday night, and this is what I saw. Dropping off my own GA3 Honda Logo at his apartment, I hopped into Albo’s Miata, and we headed towards Mount Myogi, the famously drift-happy mountain in Gunma you can read more about here. It’s the home of the Night Kids in Initial D.
Albo told me he was never quite sure who we would find, and the possibility always existed that a night could be a strike out. He had the Miata’s top down, and as we went up in altitude, even before formally getting to the mountain, I noted a chill in the air. I knew we had finally arrived when I snapped a picture of the mountain’s road station sign, and we saw some modified cars in the parking lot. Albo didn’t seem to recognise anyone, so he suggested that we instead head a bit further up the mountain. At various places there are scenic areas where you can pull off the road and just hang out, and that’s where we met a group of car enthusiasts. Including a young driver of a white and black AE86 Trueno... And he was even borrowing it from his father! But even though Albo didn’t see anyone he knew at first, I quickly realised the Initial D-style car culture is alive and well out here. There were also various Nissan Silvias driving up and down the mountains, but the major crew which was out was a team of AWD Subaru Imprezas, of various STI/WRX configurations. Basically, all the vehicles you’d expect to have found 10 years ago or fifteen years ago? They’re all still there. You don’t mess with the classics. Although the Subies were interesting (and would become far more fun later on in the evening), Albo and I were largely interested in that 86. We discovered that the paint job was relatively recent (as can be seen in the engine bay, the original color was red) but that the engine had all been cleaned. Along with a front strut bar, we noticed some various TRD internals as well. The wakaba (the leaf on the windshield) was not for show. The driver really was brand new (perhaps making him about 18 or so), and he said that he was still learning how to control the car, so he hadn’t done any drifting yet. As people just hung out and talked cars, there were plenty of vehicles going up and down the mountain. Despite various exterior lighting, body kit modifications, and loud exhaust, the vehicles did not appear to be going either very fast nor doing anything particularly dangerous. It was pretty much just people driving up and down the mountain, up and down the mountain, up and down the mountain. Although I saw nothing really which was problematic, I definitely got the impression that it wasn’t anything like non-stop explosive drifting all night long. There absolutely wasn’t any racing at all. That kind of behavior is very much illegal, and the drivers seemed skittish and overtly polite in general. The passengers, who had been drinking, were quite a bit rowdier (but then, there are no open container laws for passengers), but the drivers seemed well aware of where the line might be. Curious, I asked the guys (I was only one of two women present, and neither of us were driving that night) if they were worried about the police coming out, even with how careful they were being, and Albo asked if the police even came out at all. Did the police bother them, I asked? “Oh, we just make sure to drive slowly enough when we’re driving up and down the mountain.” Well, sure, that made sense. They still wanted their identities protected and their license plates blurred, but as someone who rarely shows her face online (when most of her coworkers have their faces in their Kinja avatars), I understood that. Most definitely. It’s difficult to say exactly what would happen if the police caught the drivers doing something blatantly reckless. Due to the popularity of Initial D (mountain drifting) and Wangan Midnight (tollway racing), Japanese police have announced crack downs, and anti-street racing legislation has been passed in recent years. It does seem like they’ve also increased patrols, but those patrols don’t seem to do much. Han in Tokyo Drift wasn’t too far off: usually driving in kei patrol cars, local police officers rarely have the ability to catch heavily modified cars should they choose to run. The last report I could find in English about prosecution was of six drivers from Chiba who didn’t just cross the line, they ran full speed across it. They organised a total of 193 illegal drifting events, but I would be surprised if it wasn’t their vandalism of train cars which is what really led to the police taking an active interest in them. While traffic violations certainly will help hammer these yahoos, it seems to me that in some ways Japanese society would be more affronted by the vandalism than the reckless driving. For Albo and myself, any arrest would probably be game over. Japan’s high conviction rate means we would be pressured to confess and plead guilty in return for minimal detention during the investigation process. We’d lose our residency statuses and be deported, most likely being barred from Japan for several years if not forever. For me, my naturalisation process would come to a very abrupt stop, and any hope of becoming a Japanase national would become a pipe dream. For a Japanese national? Almost certainly a revocation of drivers’ license, perhaps for a significant amount of time. Large fines. Potential jail time. Probable fallout with employer and family. Being fired isn’t out of the question, and in a family oriented culture like Japan, the amount of shame for being arrested would reflect poorly on anyone related to you. If a student, it could lead to your expulsion, and if you fall off the education wagon in Japan, it’s very hard to get back on. Hence all the skittishness and politeness. But that doesn’t mean they don’t have fun, whether it’s going for a drive or just hanging out with fellow car enthusiasts. Sometime later I was offered a ride in a white WRX. I thought, sure, okay, I like riding in fun cars, but given what I had previously seen, I wasn’t expecting to be that thrilled. Beyond the mountain adventures, it was nice to meet Albo in real life. Although we are both part of a professional group in the Gunma area, we actually met through a mutual friend, and we had been planning to meet up for quite some time. This past weekend, we finally did. Always a gearhead and a fan of Initial D, Albo once studied to be an accountant. But he wasn’t happy with that arrangement at all, and decided his wanderlust could only be satisfied by going to the land of his childhood obsession: Japan. Like many of us (myself included), Albo ended up in Japan by becoming an Assistant Language Teacher, a native English speaker placed in the Japanese public school system to help teach English and to facilitate cultural exchange. He came for wanderlust. I came to pay off student loans and because my native Texas had a hiring freeze for teachers. I wanted to teach (I still do, and am working towards becoming a fully licensed Japanese teacher). It was my calling then, and it is my calling now. Yet even if this is the usual way we come to Japan, most of us don’t have cars. Strictly speaking, Albo and I are exceptions to the rule. Most assistant language teachers are placed near their schools, usually within walking or biking distance. Sometimes a Board of Education or dispatch company will provide a vehicle if you must travel outside of the area in which you live, but this is not the norm. Only this past year when I bought my GA3 was it because I absolutely needed my own vehicle. My employer did not supply one, and I lived quite a drive away and my schools are not near a train line. Albo did have a bike, but he knew the answer lie elsewhere. 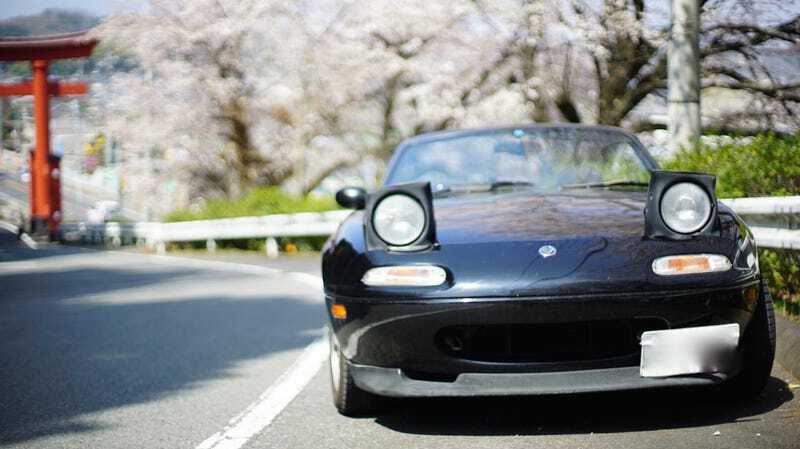 Because Miata is always the answer. As Albo continues to uncover the the real life mountain driving culture of Gunma, I will be with him, and that means so will you. Through the meet ups we have made contacts and relationships that will lead to a deeper participation in Japanese car modification and tuning. Albo’s Miata has had quite a bit of work done on it, and he’ll be introducing me to his mechanic to do some work on the GA3. Images and videos via Albo Agunday/TheJetcoaster and Kat Callahan/Jalopnik.